In light of all the uproar last week over Trump's questioning of whether burning the flag should perhaps be protected as 'freedom of speech', or not, I'll exercise my freedom of speech by questioning some common assumptions about what freedom of speech is, and isn't. "Donald J. Trump ✔ @realDonaldTrump Nobody should be allowed to burn the American flag - if they do, there must be consequences - perhaps loss of citizenship or year in jail!" , now, even allowing for his 'perhaps', the notion of losing your citizenship over burning the American Flag, or being imprisoned for a year, is, IMHO, silly, and further sensationalizes a subject that is already too saturated with it. But, that being said, what we associate with the 'flag burning issue' is something that needs a lot more consideration than the two existing poles of 'Burn it!' and 'Revere it! ', tend to permit, especially since the burning of the flag is the least important aspect of it, and more often than not, it is a distraction from what the real issue is: our Freedom of Speech... and the rest of the 1st Amendment. As much as I disrespect those who disrespect our flag, it's not the burning of the flag that I have an issue with, from a legal standpoint at any rate. What I do have an issue with, is what has become one of those default 'givens' that we hear and have heard over and over, from all sides, for so long, and so often, that we no longer get around to seriously questioning it, and that 'given' is the idea that the action of destroying property in as inflammatory a means as possible, can be considered 'speech' - let alone constitutionally protected speech. For decades I've heard that position being asserted (from the Left, and now even from the Right), and while I've heard objections to it being ridiculed, I've rarely heard the assertion really being questioned, and it seems like maybe it's about time to begin doing just that. In reading these cases and comments, and thinking about what is meant by 'Freedom of Speech', it seems to me that most of the judgments attributing the actual burning of flags (or draft cards, etc) to being a form of speech protected under 'freedom of speech', or to 'symbolic speech', are not only inappropriate, but they cheapen, degrade, and dangerously blur that concept of speech which the framers of the amendment were seeking to preserve and defend. The treatment of the action of burning objects as that were equivalent to speech, waters down and weakens our understanding of what Freedom of Speech is and was meant to be, which I think jeopardizes our hold on this fundamental right far more than even an authoritarian government ever could. Since we've accepted the idea that the destruction of property, when wrapped up in the flag, magically becomes constitutionally protected speech, how coincidental can such rioting in the streets be? I suppose that I should probably now get a few things clear about what I'm not saying or questioning, or leaving out of my consideration - I'm not in any way calling into question the need for that foundational liberty of Freedom of Speech to be vigorously defended. The freedom of speech, the ability to express our ideas - even and especially offensive ones - is a vital component of any society that hopes to have, and preserve, the liberty of its people. Neither am I questioning the importance of defending the right to political or artistic speech, whether impromptu speech, or as expressed in writing, spoken or performed on stage or on screen, or as in more symbolic forms, such as painting or sculpture, etc. Such measures which illustrate and convey ideas, despite how foul they might seem to me, they are, and should be, protected under the freedom of speech. Nor am I in any way questioning the right to peaceably assemble, or to petition government for redress - or for that matter Religious Liberty, on the contrary, and to borrow a phrase, 'They must all hang together or we will surely all hang separately', and the reason I'm questioning this, is to strengthens these vital rights, by thinking them through. One thing that I'm definitely not doing though, is questioning whether those actions which destroy the property of another, or doing so on someones property without their permission, actually is - that is not freedom of speech, it's simply vandalism, as well as an assault upon the political anchor of all of our liberties, property. Such pure vandalism and destruction of property warrants punishment in its own right, before any questions or rationalizations of 'speech' come into consideration. Destructive actions which violate the rights of others, are not conveying speech (BTW, when violent and destructive actions are committed for political purposes, doesn't that flirt with being categorized as terrorism?). A clear distinction needs to be made between that of peaceably assembling, petitioning for redress of grievances, giving voice to your dissatisfaction with government, and the action of destroying another's property, and it is of vital importance that the difference be clear in the minds of We The People. That our Supreme Court has not been especially careful in in that area, IMHO, borders upon negligence, and has borne much poisonous fruit. So again, my question isn't centered around the flag, or any other symbol, but upon the notion that the inclusion of the flag can somehow transform an overtly intimidating or destructive action, into protected speech, without benefit of actual speech or even an artistic representation of it. What I'm questioning, is, whether expanding the range of things protected under the freedom of speech so as to encompass such things as the violent destruction of symbols, strengthens our liberty, or corrupts and weakens the concept of it, and jeopardizes our ability to sustain and enjoy that very liberty that we're all supposedly so concerned in protecting. For instance, let's remove those things I consider objectionable from the action and see what we wind up with. 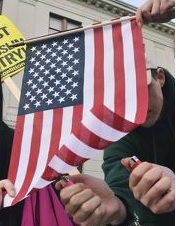 Let's say a person bought and paid for the flag themselves, and either went to their own property, or secured permission to another's property for that purpose, and without any credible effort to incite violence, with no chanting or protests or rude behavior of any kind involved, they simply, calmly, and without saying a word, set the flag on fire. Would that be an expression of 'freedom of speech'? If you said 'yes', can you explain to me why? What I'm wondering is, what is it that you think those flames are saying to you? Do they speak to you of objections? Protests? Displeasure? Hatred? And if so, with what? Foreign policy? Racism? 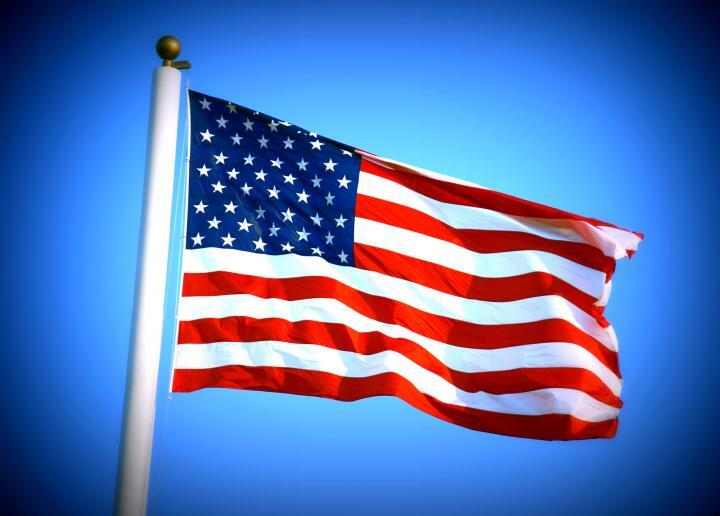 The particular cotton and rayon blend that the flag was printed upon? A dislike of Americans or just for American policy? Explain to me how you know that those sly whispering flames aren't simply expressing a dislike of the IRS... or of Hollywood, or of any of those other 'reasons' I just mentioned? If you just tried to put your feeling into speech, you probably found that the specific action of burning the flag is unable to communicate anything of relative certainty, unless it is accompanied by either hostile or reverent actions. And yet even the simplest speech, even dryly and robotically repeating the very chants cited in Texas v. Johnson 's "America, the red, white, and blue, we spit on you", repeating that without any emotion or inflection, or even silently printing that chant out in block letters and without the accompaniment of any visual effects at all, even then, those words clearly communicate an unambiguous dissatisfaction with America. Don't they? Why does the former communicate no clear meaning on its own, while the later is clear under any circumstances? The answer is that only one of them is actually a form of speech, and the other is nothing more than a theatrical prop for that speech, a visual special effect, a theatrical contrivance to emphasize an idea, but it is not an idea itself, and so as it contains no communicable idea on its own, it is devoid of the attributes of speech, which is what that portion of the 1st Amendment is there to protect, preserve and safeguard: our ability to entertain and meaningfully communicate ideas in art, discussion and debate. And to go a step further, while people assume that burning the flag 'expresses displeasure', why are we so quick to flatly assume that it is expressing their dislike of the flag, or even of America? Because it's on fire? Since the point of arguing that such 'symbolic action' is protected speech, can you rightfully ignore that the custom of those who revere the flag, is to burn any flag that's been soiled, as an expression of their respect for the flag? Or to break it down to the ridiculous, do flaming birthday candles express displeasure of the candles, cake or who you're presenting them to? Does lighting off fireworks express our displeasure with America? Were the Vikings or American Indians expressing their displeasure for the dead, when they burn their bodies on a funeral pyre? If the act of lighting the flag on fire, in and of itself, is 'speech', then isn't it a very strange and mute kind of speech that doesn't seem able to communicate any one particular kind of thing at all? It is confused or even mute, because burning the flag is an emphatic action, but it is not in itself, speech, or even a substitute for it. The 1st Amendment protects speech, not each persons indistinct and pre-verbal feelings of angst. It is ridiculous to pretend that burning a symbol to ashes somehow gives off 'speech' - how, in the smoke? By way of some sort of chemical reaction? It is untenable. Those who run up and burn the flag are very likely doing it because they despise something about America, but in justifying such actions as speech, by stretching the concept of what constitutes speech to the point of setting a flag on fire, can that really 'speak' anything meaningful to us at all? To say that it can, seems ridiculous to me. "JUSTICE BRENNAN delivered the opinion of the Court. After publicly burning an American flag as a means of political protest, Gregory Lee Johnson was convicted of desecrating a flag in violation of Texas law. This case presents the question whether his conviction is consistent with the First Amendment. We hold that it is not. While the Republican National Convention was taking place in Dallas in 1984, respondent Johnson participated in a political demonstration dubbed the "Republican War Chest Tour." As explained in literature distributed by the demonstrators and in speeches made by them, the purpose of this event was to protest the policies of the Reagan administration and of certain Dallas-based corporations. The demonstrators marched through the Dallas streets, chanting political slogans and stopping at several corporate locations to stage "die-ins" intended to dramatize the consequences of nuclear war. On several occasions they spray-painted the walls of buildings and overturned potted plants, but Johnson himself took no part in such activities. He did, however, accept an American flag handed to him by a fellow protestor who had taken it from a flagpole outside one of the targeted buildings. The demonstration ended in front of Dallas City Hall, where Johnson unfurled the American flag, doused it with kerosene, and set it on fire. While the flag burned, the protestors chanted: "America, the red, white, and blue, we spit on you."" "...While the Republican National Convention was taking place in Dallas in 1984, respondent Johnson participated in a political demonstration dubbed the "Republican War Chest Tour." As explained in literature distributed by the demonstrators and in speeches made by them, the purpose of this event was to protest the policies of the Reagan administration and of certain Dallas-based corporations. The demonstrators marched through the Dallas streets, chanting political slogans and stopping at several corporate locations to stage "die-ins" intended to dramatize the consequences of nuclear war...." and "...the protestors chanted: "America, the red, white, and blue, we spit on you." If we assume the best case scenario about the manner in which protesters might have marched through the streets, that much warrants the protections of the 1st Amendment's to peaceably assemble, and somewhat less clearly, it can make a credible claim to the 1st Amendment's protection to petition their govt with grievances, and of course the Freedom of Speech. "...On several occasions they spray-painted the walls of buildings and overturned potted plants, but Johnson himself took no part in such activities. He did, however, accept an American flag handed to him by a fellow protestor who had taken it from a flagpole outside one of the targeted buildings. The demonstration ended in front of Dallas City Hall, where Johnson unfurled the American flag, doused it with kerosene, and set it on fire. ..."
"Words do not constitute an overt act; they remain only in idea." , and conflating them with action, is dangerous to the defense of both. This passage,"While the flag burned," should be separated from '...the protestors chanted: "America, the red, white, and blue, we spit on you." by more than a comma; the later portion is the actual speech with which our liberty depends upon us to protect, while the former, 'while it burned' is nothing more than a special effect to highlight that speech which was spoken - and again, special effects are not themselves speech. Burning the flag is an action, not speech, it's just you burning stuff while stomping your feet, and the more we move towards seeing them as one, the closer we come to putting our freedom of speech in real jeopardy. If you make emotional actions equivalent to speech, you not only encourage the notion that attacks upon persons can be permitted as 'expressing your freedom of speech', but you will eventually find, when things go too far, that actual speech will be curtailed, along with such violence, when people have finally had enough of it. You cannot conflate the two, without eventually putting both in great peril. If you want to express your displeasure with America in a way that can claim the protections of our freedom of speech, and do so in a manner that doesn't impinge upon the those other measures protected under the 1st Amendment, then you need to be using words, or clear substitutes or symbols for them. And if you accompany those words with the action of a flaming flag, be aware that those flames only accent the speech, they are not speech itself. Burning the Flag, the symbol of America, is an action, not speech. It is not even properly symbolic, it's but the active and meaningless destruction of a meaningful symbol. 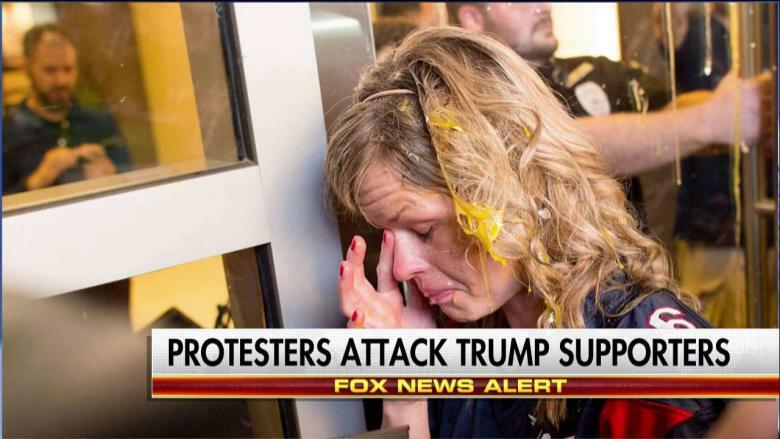 At best such protesters are using destructive or intimidating actions to express FEELINGS! and LOUD NOISES!, but nothing that can be understood as speech. What can't be understood or communicated, can't be said to be speech - feelings, yes, but not speech, and our 1st Amendment, thank God, does not protect your feelings. Only modern colleges attempt to do that. 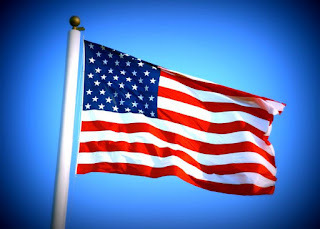 The flag is, of course, a symbol, and a particularly rich one, deep with meaning in its Stars and Stripes, symbolizing our defining principles of liberty under the Rule of Law established to limit the fearsome power of government, to the purpose of upholding and defending the lives, individual rights and property of its citizens, as citizens, who are regarded as equals before their laws. We've already seen how poorly the action of burning a flag puts anything intelligible into speech, but does it do any better symbolically? What symbolic speech does the flag burner convey by destroying the symbol of our nation (or any other symbol, for that matter)? I'm not asking why they burn it, or for an evaluation of it, only for you to tell me what it says - can you? Are they attempting to symbolically express their dislike for those particular men who fell short in living up to what our flag symbolizes? Or is it their dislike for the worthy ideals that some or many particular people fell short in defending? Are they symbolically criticizing those high ideals, or those who failed to live up to them? Does allowing any ambiguity in that distinction make any damn sense at all? On such an important question, the flag burners are, by their own actions, unfit to express their pre-conceptual angst, seemingly mute before it, unable to do anything but give vent to their emotions by destroying a symbol of elevated concepts and values which they apparently can't begin to understand or put into words themselves. In a very real sense (though perhaps not legally actionable), burning the flag, is itself an assault upon the spirit of the 1st Amendment, and by means of something other than what it stands in defense of. Symbols are able to convey deep concepts and the highest thoughts of ordered speech, and it takes more than destroying those symbols to elevate such destruction to an equivalent level of thoughtful speech. Destroying the symbol of such thought does not itself create or convey thought, it only destroys it, symbolically, or actually. 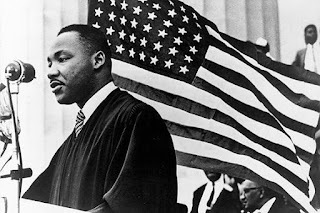 To take it to the extreme, in murdering Martin Luther King as the symbol of the Civil Rights movement, James Earl Ray did not express any ideas worthy of protecting, he did not communicate one iota of speech, point of arguments or words of eloquence, he merely murdered a greater man than he was. MLK is such a powerful symbol today, because he was supremely capable of eloquently communicating high ideas and arguments, through words, and through moving and meaningful symbols of liberty - and the 1st Amendment afforded him the protection of the law to do that, no matter how the Bull Connor's in Govt at the time desired to revoke his freedom to put those ideas into speech. The destruction of symbols, living or inanimate, do not constitute speech, actual or symbolic, they only seek to put an end to such speech. Destructive actions such as that convey no more speech than a savages' incoherent howl. By setting such a symbol as the American Flag on fire, people at best identify themselves as being incapable of freely expressing even a single criticism in words that others can understand - and they show no respect for the need to; they display themselves for all to see as better suited to the savage barbarity which the accepting of such actions as speech is most likely to engender and spread. Burning the flag is not, and cannot be, speech - it is only a destructive action, nothing more. In certain contexts it may deserve to be protected; the 9th amdt affords enough unenumerated rights and powers to individuals, to secure and preserve legitimate means of protesting, and I'm sure that a clever lawyer could, and probably should, be be able to cite a defense for people who wish to add such theatrical emphasis to their speeches - if they can do so without violating the rights of their fellow citizens - but it still does not fall under the banner of the Freedom of Speech. The question we should be asking ourselves now is not what Trump tweeted or how to punish anything other than arson, but questioning what it is that accepting such actions as speech does to our own understanding of what speech is. And we should question what must surely follow when such barbaric actions are elevated to the level of civilized speech, and unwisely defended on the same grounds, as if they were the same thing - such equivocations can't help but be dangerous to all of our liberty. So if I'm correct in saying that neither vandalism nor violence, can be considered to be 'freedom of speech', what do you suppose it is that we've invited into our popular consciousness, by saying that such actions are the equivalent of speech? Doesn't making the claim that such actions are protected forms of speech, say that you have a constitutionally protected right to commit vandalism and violence? That seems as ridiculous as saying that 'peaceful protests' can involve forcibly prevent other people's freedom of movement in going about their lives, destroying public and private property, and rioting in the street. I'm not attempting to elevate the flag to the status of a protected object (but aren't the flag burners actually attempting to surreptitiously do just that? ), or to make burning it a taboo - if you want to burn the flag, buy one, take it to where you have the right to burn it, and burn it, gather around the flames and chant over it, broadcast it, stream it, do it however you'd like; flame away to your hearts content. I would not dream of forbidding that to you, and in fact I worry that attempting to extend government power to the preservation of such worthy symbols, does put the liberty it symbolizes in jeopardy. "... The result of the Texas statute is obviously to deny one in Johnson's frame of mind one of many means of "symbolic speech." Far from being a case of "one picture being worth a thousand words," flag burning is the equivalent of an inarticulate grunt or roar that, it seems fair to say, is most likely to be indulged in not to express any particular idea, but to antagonize others. Only five years ago we said in City Council of Los Angeles v. Taxpayers for Vincent, 466 U.S. 789, 812 (1984), that "the First Amendment does not guarantee the right to employ every conceivable method of communication at all times and in all places." The Texas statute deprived Johnson of only one rather inarticulate symbolic form of protest - a form of protest that was profoundly offensive to many - and left him with a full panoply of other symbols and every conceivable form of verbal expression to express his deep disapproval of national policy. Thus, in no way can it be said that Texas is punishing him because his hearers - or any other group of people - were profoundly opposed to the message that he sought to convey. Such opposition is no proper basis for restricting speech or expression under the First Amendment. It was Johnson's use of this particular symbol, and not the idea that he sought to convey by it or by his many other expressions, for which he was punished." "... flag burning is the equivalent of an inarticulate grunt or roar that, it seems fair to say, is most likely to be indulged in not to express any particular idea, but to antagonize others..."
That's spot on. Which leads to what I disagree with him on, and what I believe undercuts his case, that such actions can then be considered to be "symbolic speech" while at the same time, not be speech. It can be an action, a special effect, a provocation, but it is not symbolic or a symbol, it is only the destruction of a symbol, and should not, cannot be, considered to as speech - symbolic or otherwise. And while I thoroughly understand and agree that the Flag is properly loaded with symbolism, and that it plays a vital role in the hearts and minds of Americans, I do not believe that the govt can play a role in preserving or protecting it. that is pretty much where a prudent evaluation of the matter must end up at. While I sympathize with those who'd like to pass a law protecting the American Flag, the power that such a law would give to government would be impossible to contain, and would soon be used to destroy the liberties which that flag stands for. We cannot protect the flag through laws, but only by better understanding what it stands for, and by reasoning with, or speaking out against, those who'd put both flag and the understanding of it in peril. To wrap it up, what I'm saying is that the idea that destroying a symbol can somehow transform provocative actions into speech, without benefit of actual speech, or even an artistic representation of it, is a danger to actual speech. You could of course actually paint, speak, stage or film yourself destroying revered and symbolic objects, even including in your 'art' the burning of property, even dramatically punching a judge in the face, and get away with calling that artistic expression - in a theatrical setting. But the 'fourth wall' is a very real one, and if you step beyond it into 'real life' and physically walk up to someone and destroy their property or punch them in the face, you're not going to get away with calling that either political, artistic, or symbolic speech. It is only violence, and nothing more, and engaging in it carries you across the Fourth Wall from the theater of art, and into a Hobbesian theater of war of all against all; a warring on speech, on property, and so on Individual Rights and the Rule of Law. What those who think of themselves as defenders of 'free speech' are doing, in redefining what speech is, is extremely dangerous. When a definition is stretched to the point of including that which it is clearly not, along with what is so essential to what it actually is, that is not strengthening the concept which such actions are hiding behind; you are not broadening the identity of speech by doing so, you are corrupting, weakening, and slowly destroying it where it really matters, as questions of 'what the meaning of 'is' is' operate like termites in our common understanding. By accepting broad and watered down redefinitions of what speech is, we've opened the door to tyrannical abuses of our core rights and liberties, by those who seek to dominate us through such actions, wrapped up in the flag as if they actually were instances of speech. The consequence of our having made such errors, are brutally visible in the popularity of the belief that riotous 'peaceful protests' should be tolerated because they have '1st amendment protections! ', as one enthusiast described protesters marching through traffic, terrifying the car's occupants, damaging their vehicles, and smashing store windows as they passed. How free can Freedom of Speech be, when protecting the Freedom of Speech of some, entails infringing on, or ending the ability of others, to peacefully discuss or act under such ideas? In our swallowing that position as being a legitimate one, I think we've swallowed a poison pill. What seems apparent to me, is that by allowing what is not speech, to be protected as if it were speech, we are jeopardizing our Freedom of Speech by allowing the indiscriminate exercise of physical force and violence to mask itself as being speech, and in so doing makes the freedom of speech - and our liberty - that much less secure. If anyone has an argument to show me where I'm going wrong here, I'd dearly appreciate your speaking up. Blog:A blog (a blend of the term web log) is a type of website or part of a website supposed to be updated with new content from time to time. Blogs are usually maintained by an individual with regular entries of commentary, descriptions of events, or other material such as graphics or video. Blogodidact: (a blend of the term blog and autodidact) Weblog of a person discussing items of interest encountered along the way of becoming self-taught while working his way through the materials and ideas of Western Civilization, beginning with Homer, to the present day. The Blogodidactic process, though technically first begun in the mid 1980's, had its first known use in August of 2006. Dr. Gina Loudon-Live Out Loud! Invocation receives standing ovation, despite attempts to stop it. What gifts has Christmas brought you? In school, I was the quiet kid in the back, then I spent the '80's playing in a travelling Rock Band on the West Coast. I stopped that to get married and have a life; in the process I've passed from Sales, to Teaching, to Coding, to Parenting and learning how the world went from Gilgamesh to the Founding Father's, to the fun filled world of today.